Notifii Track Reviews Recently Reviewed! Pros: This software is great for 2 general areas. The program is detailed and easy for our Mailroom staff to use, while also being extremely intuitive for other employees to figure out and use on their own. Cons: Honestly, only minor usability errors here. I would like to be able to click the entire box or maybe the name/tracking number to access the details of a package or employee instead of having to click the tiny icons at the far right of each listing. Also, there are sometimes inconsistencies between the iPad and the computer program, where it might take some time to update to the other. Overall: Overall, having Notifii Track has been a massive improvement to our Mailroom. We have been able to reduce labor in our mailroom, cutting back on the actual work our staff is doing and also reducing the hours the mailroom is staffed due to the automation and ease of use Notifii Track on an iPad has brought to our system. Thank you so much for taking the time to review Notifii Track - we are so excited to hear your feedback and love that you feel like the program is intuitive and easy to use. That's our number one goal! We truly appreciate you taking the time out of your day to give us such an incredible review and we look forward to serving you and your business for years to come! Cons: The option to include more pictures on the initial e-mail would be nice (to better define damages). Overall: It made my daily work much faster and easier. It opened the door to a new world of record keeping. The program truly is only limited by the will and creativity of the user. Thank you so much for taking the time to review your experience with Notifii Track! We love hearing that you enjoy the ability to take pictures of the packages, note the condition, and review our extensive user reports. We truly appreciate you taking the time out of your day to review Notifii Track and love that you feel like our software is a fantastic addition to your package management process! Pros: I manage a student housing complex which employs full time office staff, along with part time student workers. My favorite things about Notifii are that it's easy to use, accurate and saves us time. Notifii clearly communicates to residents both when a package has been delivered and picked up. There's also the option to add more information to the notification, such as the package being heavy or perishable. Notifii also helps us avoid confusion between staff members since everything is traceable- from the moment the package is logged into the system, to where it is put in the package room, to when it's picked up and by who. We also love that all the notifications sent out are customizable. Cons: In all honesty, we haven't run into any problems with Notifii since we started using it. The one time I contacted customer support, the issue was on our end with our internet provider, but the response time and follow up from the Notifii customer service team was amazing. Overall: Notifii is great for any housing complex because it syncs with the property management software so you are not able to log in a package for someone who doesn't live there. This saves space so you immediately know what to send back and saves time looking up names/apartment numbers. There is a record of every package that comes in and out of the office and there are a number of features that you can customize to fit your specific need. Thank you so much for taking the time to review Notifii Track and give us your feedback! We're so happy to hear that your team is saving time with Notifii and using all of the different options that the software has to offer. We truly appreciate you taking the time to give us your feedback and we look forward to continuing to service your community in the future! Pros: It does make it very easy to contact residents of our apartment for anything. The package check-in software is very nice, and now with the kiosk feature, more streamlined to eliminate any confusion on the part of the residents. Cons: We've had some issues with certain residents not receiving the text message notifications, though that problem likely lies with the cell phone carriers. I do wish that there was some delineation in the text messages, so that they're not receiving the package notifications and community texts all from one number. The people that have a bunch of packages filter in from various couriers all day may end up missing something important. Overall: It makes it very easy to send out mass texts and emails, and then to also easily contact certain groups of people. Generally, I have very positive feelings towards Notifii. The kiosk mode of the package check-out feature has been a huge help (especially since I no longer have to manually update the app after checking in a new batch of packages). Thank you so much for taking the time to review Notifii Track! We are happy to hear that you enjoy the package management software and that you are utilizing the new kiosk feature! We agree that there is always room to improve, and really appreciate your feedback on the phone number that the notifications come from. We will absolutely pass that along to our tech team and truly appreciate you taking the time to give us your feedback and look forward to supporting your package management and communication operations for years to come! 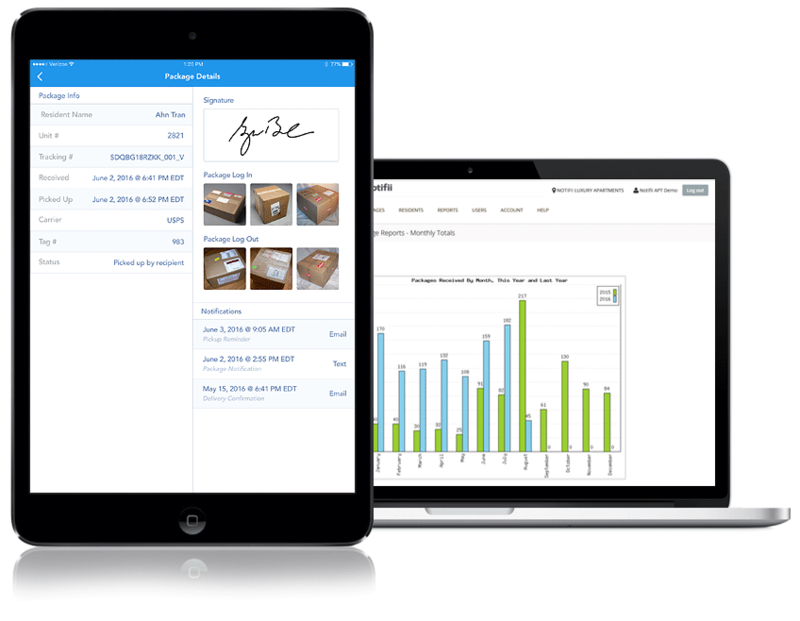 Overall: The ability to record incoming and outgoing packages in a digital format. The ability to view archive records in real-time. Thank you so much for taking the time to review Notifii Track! We appreciate your feedback so much and take it seriously. 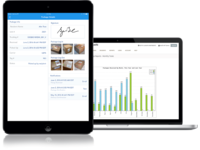 We are excited to hear that you feel like Notifii Track is an excellent "core" product for your mailroom management needs. We truly appreciate you taking the time to give us your feedback! Pros: It is extremely user friendly. Cons: Sorry its taking me too long to try to answer this question. Unable to think of any. Overall: We were able to go from a labor intensive, human error filled, time consuming paper slip system to a system that is able to document and monitor anything arriving at our site. As a manager, my stress level went from a 9 on a scale of 1-10 to maybe a 1. Thank you so much for taking the time to review Notifii Track! 50,000 packages last year with ease? That's the kind of feedback that we absolutely love to hear! We are so excited to hear that your team has saved tons of time and stress using Notifii and look forward to continuing to serve you for years to come! We very much appreciate you taking the time to give us your honest feedback and we are so happy to hear that you've loved using Notifii Track to streamline your package management processes. Pros: I love how easy it is for us to log a package. We get a lot every day for all of our residents, and the ease of checking it in is awesome! I also love that it reminds the residents that they have a package and they can see a photo of the package that they received so they know what they are picking up. Cons: The downside to the new feature, we don't have the most updated technology and can't use the new scan feature to log the package. Overall: Overall it is awesome. Anytime I had an issue calling in to Customer Service is simple and it is so great. I really love the whole process. Thank you so much for taking the time to review Notifii Track - we are excited to hear that you feel like it's super easy to log in a package and that you guys utilize the photo feature for your package log-in! When you ask about the new feature, are you inquiring about the OCR (Optical Character Recognition) feature? If so, you should be able to update your app to the newest version and it should be easy to use on any smartphone or tablet - if you want to confirm that there's no way to get this going for your property, please give us a call and we are happy to help! Pros: Our apartment community receives a lot of packages daily, and we used to keep track of them in a binder. We constantly had issues with packages not being logged in and out correctly, which caused a great deal of hassle for the residents (and the office). This system is so easy to use and fun! It takes seconds to log in and out a package, plus it notifies the resident immediately. We used to have packages sitting in the package room for weeks taking up space, but now most packages are picked up same day. No more overly stuffed package room. We utilize the app on an iPad, our iPhones, and the desktop. More than one of us can log in packages at the same time, which really saves us a lot of time. We love this system! Cons: We don't have any complaints. We have used it for a year, and we absolutely love it. Overall: Great software! Great company with great customer service. They really made it easy to order, get set up, and they even check in on us. Thank you so much for taking the time to leave such an incredible review on Notifii Track! We love that Notifii Track has been the answer to your package nightmare and are so excited to hear that you guys think using the app is fun and that packages are being picked up same-day! We truly appreciate your feedback and are so excited to hear that you feel like Notifii Track is an invaluable asset to your team. Pros: I love the ease of the software, the ability to back up the properties especially when in student housing when hundreds can come daily and the availability to add additional security which makes residents feel comfortable. Cons: I don't have anything negative to say and I've used this product at multiple properties over the last 7 years. Overall: I love it! I remember the days of making list and maunually contacting students to get packages through phone calls, outside texting services or just delivering to clear out the storage closet but this product has made our lives so much simpler. Allows my part time staff to organize and track what we are taking in and with everything being delivered these days it allows us to take photo's and ensure we are tracking what we hand out and to who! Thank you so much for this incredible review! We are honored to hear that you feel like Notifii Track is one of the greatest tools you've experienced on site over the past 7 years. We love hearing that your students love the product as much as your staff does - it's a win-win! We truly appreciate you taking the time to review Notifii Track and we look forward to serving you for many years to come! Pros: What I like most is that Notfii keeps up with technology, so they're always adding new features that make using the app and logging packages a breeze. They also have a really cool function where you can display received packages on a TV that updates in real time. Our residents love that feature. Cons: I wish there was an easy way to delete previous residents. There may be, but I'm not sure what it is. Thank you so much for taking the time to review Notifii Track - we love seeing that you gave the software a perfect 5-star rating and love that it helps make logging in packages a breeze! Great question on the ability to delete previous residents - there isn't a way to do that because the software keeps all records of packages logged in. You can, however, list the resident as a "Former Resident" so their name doesn't pop up, but you are not able to delete old residents as a precaution to protect your team incase anything popped up in the future! Hope that helps! Increase your Customer Service "Track Record"
Pros: I love being able to scan and send an immediate package notification, with a package picture, to our residents. Every package coming in the door is scanned before being shelved, so we never have to wonder if we got someone's package. Plus, the reminder emails or texts to residents keeps the build up of pkgs. to a minimum, very useful year round but especially so during the holidays. Cons: I can't say there's anything I don't like about this product. Overall: Another really cool feature is being able to send e-mails and/or texts to our residents. Whether you just have one resident or want to send a blast email to all, this is the best way. In addition, you can schedule your notifications to be sent out as needed. Thank you so much for rating Notifii Track a perfect 5-star product! We love that you say there's nothing you don't like about the product - what a huge compliment! We truly appreciate you taking the time to review us - we know how busy community managers are, especially around this time of year! Thank you again for your incredible review and we look forward to our continued partnership! Pros: This program is simple to use, very user friendly, and still has all the information you could want regarding the packages rec'd and distributed. It is also reasonably priced. Customer service is always immediate. i have not had to wait for answers to questions and the rep. is always pleasant to deal with. Cons: I have not encountered any problems or issues with this program since I have been using it. Overall: Notifii is used to track and notify our student population when they have rec'd a package. It also provides me with statistical data regarding the number of packages, delivery times, the volume rec'd from each Carrier. I would highly recommend Notifii. Thank you so much for the incredible review! We love that you feel like Notifii is easy to use, user friendly and packed with helpful reports. We take pride in always being available for our customers so we are so happy to hear that you've had a great experience with our customer service team as well. We truly appreciate you taking the time to give us your feedback and look forward to serving your university mailroom for years to come! Pros: Notifii seems to have all the tools I need to keep our package system organized! I love that each user has their own unique login, you can take photos of packages on arrival and have residents sign to pick them up. I feel a much better sense of security with our resident packages knowing all these checks and balances are going into effect all the time. Plus it's super easy to print a log and audit our package room to ensure nothing has been missed! Cons: Notifii has fixed all my concerns as I've reached out to their support staff. I currently have no complaints! Overall: Notifii seems to have all the tools I need to keep our package system organized! I love that each user has their own unique login, you can take photos of packages on arrival and have residents sign to pick them up. I feel a much better sense of security with our resident packages knowing all these checks and balances are going into effect all the time. Plus it's super easy to print a log and audit our package room to ensure nothing has been missed! Thank you so much for taking the time to review Notifii Track! We absolutely love hearing that you feel like Notifii Track has all the tools you need to keep your package operations streamlined and organized and that our support team has helped answer any questions that have come up! We truly appreciate you taking the time to give us your feedback and look forward to serving you and your team for years to come! Pros: It sends out an automated email (our from our general mailbox) to the tenants when we enter their packages. It also gives them the chance to sign out their packages (helping us keep track of what has gone out in case the tenants come by saying they haven't received their packages). Cons: There should be an easier way to choose a number of tenants and delete them from the system (when the tenants have left the building). And there should also be an easier way to enter multiple tenants into the system at once. Overall: It has been very useful to us at my property and the tenants appreciate it a lot. Thank you so much for taking the time to review Notifii Track - we love hearing that it's been a helpful addition to your package tracking operations and that your residents love getting notifications on their package deliveries! Pros: That it notifies the resident immediately via text and email once the package is scanned. Residents are so very appreciative of the notifications. It also eases the workload for employees in not having to constantly h stop work and leave the desk to search for packages. You can simply keep the tablet (or your phone if you choose) at your desk and search for packages on the device. Cons: I do not have any negative comments on the software. Overall: The benefits of this product are numerous. Since we purchased the software, we have had no incidents of "lost" packages, no resident complaints, and fewer interruptions. Once residents realize that they will always receive a notification when a package arrives, they become accustomed to the reliability of the software AND the leasing office. Thank you so much for taking the time to leave such an incredible review on Notifii Track! We love that your team has had no incidents of "lost packages", no resident complaints and fewer interruptions - that's exactly why we created Notifii! Pros: Easy to enter recipients and adjust contact info. Easy logging and tracking. Love the app. Cons: Cannot customize the text alerts and sometimes they are too abbreviated. But most importantly...text messages do not include alerts when you check boxes such as "fragile" or "perishable". Only if the recipient has an email will they receive more detailed alerts. Big fail. Thank you so much for taking the time to review Notifii Track! We are happy to hear that you love the app and that you feel like it's easy to log and track packages and enter recipients! The text alerts are fully customizable. To change the settings for your text message alerts, please login to the desktop version and then click Track -> Settings -> Notification Templates -> Package Notification -> and then enter the placeholder "Special Handling". This will send the end recipient any special handling details that your team noted upon intake. If you'd like us to walk you through it, please give us a call at 888-506-8536. Pros: I like this software because of its ease of use. Cons: I don't like that Notifii Track and Connect are separate. Overall: I enjoy using Notifii Track for our company. Thank you so much for taking the time to review Notifii Track! We are so happy to hear that you feel like the software is easy to use and that you enjoy using it at The Armstrong! Notifii Track and Notifii Connect are two different softwares, which is why they are separate. Notifii Track, our package management solution, helps track packages, scan them in, send automatic notifications, etc. 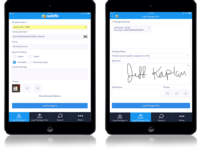 while Notifii Connect was created to have a fully functioning communication portal that organized and streamlined your text and email communications to your residents. We have many customers that use one or both of the modules, which is why they are two separate entities. Hope that helps explain why Notifii Track and Notifii Connect are separate! Have a great day and thank you again for taking the time to review Notifii Track - we appreciate your feedback and look forward to serving you for years to come! Pros: I think that Notifii Track is a good program to help our community log packages in and out and to keep track of all packages. Notifii is very easy to use and reliable. I would defiantly recommend Notifii for other businesses and package tracking. Cons: We did experience a problem with Notifii not sending out emails or text messages to reidents when packages were logged in but we are looking into that with customer support. Thank you so much for taking the time to review Notifii Track! We're happy to hear that your property is benefiting from the ease of use and that you would definitely recommend Notifii Track to other businesses for package tracking. Our customer support is available by phone or web chat Monday-Friday during business hours and would be happy to help you troubleshoot the reason that your residents are not receiving emails or texts! Those specific residents may have opted out of communication, your property management software may not be syncing correctly, or your notifications may not be formatted correctly to not be seen as "spam" by the carrier. Please give us a call and we can figure out what the issue is in just minutes! Pros: Love how it keeps track of packages. Easy to use. Cons: Sometimes emails don't go out even if it says it did. Not a trust worthy when it comes to sending out noitifications. Overall: Notifii is an okay product. When the package changes and the pricing went up to include texting and emails for our residnets. It was a shame. We used it, even if it wasn't as reliable as we would like. We pay for multi email and text apps and it just isn't in the budget to pay for another that isn't reliable. Thank you so much for taking the time to review Notifii Track! We truly appreciate you taking the time to give us your feedback. The pricing changed in 2019 because Notifii Track, our package tracking product and Notifii Connect, our communication solution are now two separate entities. We wanted to focus on building out features that would serve our clients in each module, so they are now different products. We're sorry to hear that you're not happy about these changes and are hear to answer any questions that may arise in the future. Pros: Love the use of the ipad to log, track and sign out packages. The software is easy to use and is very valuable for the residents to receive text or email messages to pick up their packages. The reporting is also very useful in determine and tracking key performance data. 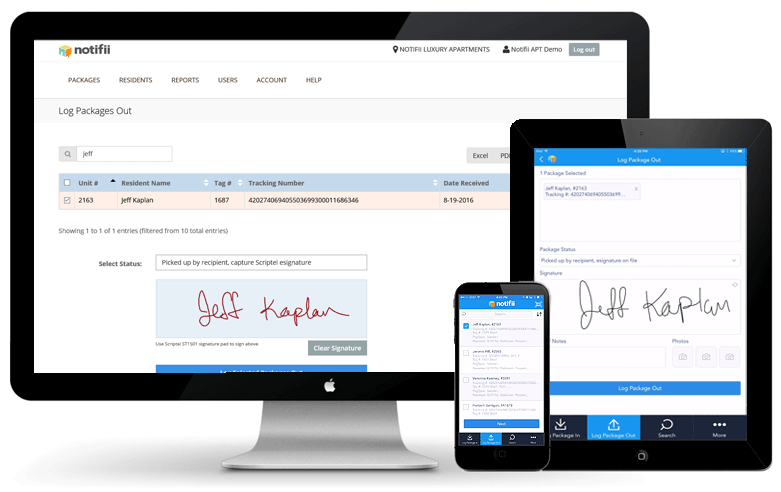 Cons: Would love to see them team up with residential property management for integrations. Overall: Great customer service every time I need something. Thank you so much for taking the time to review Notifii Track! We are happy to hear that you love the automated notification system and reporting! 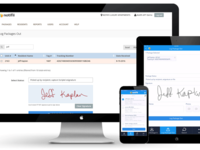 Our software does integrate with most residential property management systems, including Yardi, Realpage, Entrata, RentManager, and more! Please reach out to us regarding getting that set up for your properties if you'd like. Pros: Just like that separate the packages, enter the apt number scan and complete. The notification to the residents is the best, why? because they know their package has actually been delivered. Which help with wasted call time to the office, I've had amazing experience working with Notifii..
Cons: There's truly nothing to dislike, a little time consuming removing the old residents. Other than that adding and editing resident info is super easy, we allow the resident to place their information. Thank you so much for taking the time to review Notifii Track! We are happy to hear that you love the software and that you've saved time using Notifii! The Best Package System Around! Pros: The ease of the logging in and out. Quick and efficient and no issues with residents missing a notification via text/email that their package has been processed. Cons: There is nothing not to like. It's a very simple program to figure out. Overall: Running a 924 bed student housing apartment complex, our residents love ordering packages. From books to household goods to care packages from mom. This system is by FAR one of the best I've used and would be the only one we will use. Our company tried another service and within a week, we were back to Notifii! Thank you so much for taking the time to review Notifii Track! We love hearing that Notifii is the best package management system around - the fact that you tried another solution and came back to Notifii makes us feel so honored! Thank you again for taking the time out of your busy day to share this incredible review - we really appreciate it! I have had Notifi for 3 years now and the bang for the buck is excellent. Pros: I like the fill in capabilities of the software for senders and location. That feature saves a lot of time. I also like the simplicity of the functions and screens. It has proven to be very easy to train new people on the software. Cons: The think I like least is that USPS categories are not complete. It is missing one or two categories and the names of the other categories are not always updated to what the USPS is currently using. The only other problem I have with the software is the number of steps needed to update the records of those in the database. Overall though it is a minor nuisance. Thanks so much for this great feedback! We're so happy to hear that your team is enjoying Notifii Track and that you feel like you're getting great value for your money! Pros: It makes all the difference with packages and properties that do not have package lockers. Cons: the text feature needs some work. when residents respond through our chat. It comes to our email as if they are responding to an old message and it confuses us in the office if we have not sent that particular message out. Thank you so much for taking the time to review Notifii Track! We love hearing that you love the software and are happy to see the likelihood you'd recommend Notifii is 10/10! Pros: The software is easy to use, recognizes all of our residents and has been the best at communicating all inspections and community updates to them. Cons: The feature I disliked has already been improved which was the ability to stay signed on for at least 8 hours +. Thank you Notifii! Overall: The picture feature for resident packages has made residents aware of what package came in and if it was something important for them. Thank you so much for taking the time to review Notifii Track! We love seeing your review that Notifii is the BEST and we are happy to know that the changes to the maximum signed-on times fixed your only concern! Easy to use and helpful in the office. Pros: I can access it via my phone, tablet, and online. Anywhere you have connectivity you can use this product and make updates to your roster. Cons: Not necessarily a con, but we don't use all the functionality. The suite has plenty of great option for someone that needs all that it offers . Overall: It works consistently and without issue. I recommend it. Thank you so much for taking the time to review Notifii Track! We are so happy to hear that you think our service is easy to use and helpful at your office! The ability to access the software from anywhere is a fan favorite and we are excited to see that you enjoy that accessibility. We truly appreciate you taking the time to give us your feedback and look forward to serving you for years to come! Pros: The program is very easy to use! Training staff on it takes 2 minutes and residents love the notifications. Cons: We use two different iPads for this in our office and it only lets you be logged into the account on one device. Thank you so much for taking the time to review Notifii Track! We are so happy to hear that you feel like the software is easy to use and efficient! You should be able to run the Notifii app on both of your iPads concurrently - are you using the same login permissions for both, perhaps your property uses one primary login no matter who is logging packages in and out? If so, please create another login (maybe property2 or something similar) and you will be able to use the software on both of the devices at the same time. Hope this helps! Pros: Allows you to keep a log for packages that is easily searchable and tracks who did what and when. Cons: It is fairly foolproof, but sometimes you can scan the wrong bar code, but that's easily remedied. Overall: With the sheer volume of packages that we receive our apartment complex, it became necessary to utilize this sort of tracking system and Notifii has been a good one to use. Thank you so much for taking the time to review Notifii Track! We are happy to hear that you feel like Notifii Track has been a good tool to use for your package tracking needs and that you enjoy the search functionality as well! Pros: Notifii is a great solution for the tracking of the intake and distribution of packages in a student housing system with over 11,000 residents and numerous mailroom locations. It is easy to use and very intuitive. Cons: Sometimes it takes a little while to load information when on the website, but we have a large amount of data, so it is not entirely unexpected. Overall: The product has met a need to make the package acceptance and distribution process much easier for our staff and our community members. Thank you so much for taking the time to review Notifii Track - we truly appreciate your feedback and love hearing that you feel the software is intuitive and easy to use! Pros: Mostly easy to use with a simple learning curve. Package Tracking is A-. The only tool that could make it better would be a way to pause the package messages until a specific time or wait for x minutes before sending them. We end up trying to scan packages and hand out packages at the same time and it can double the time it takes to log everything in. Cons: Generating contact data for a full turn property can be problematic - With the new plugins to Entrada and Yardi ths should be great assuming the software you are porting from has the data you need. For instance, a poorly integrated Yardi port may get you the correct room number for everyone, but if you don't have phone numbers in Yardi, you'll need to generate a list from wherever you do have that info. Don't even think about trying to integrate a list inside Notifii, that's just asking for a full wipe. Wiping your contact list is WAY TOO EASY. The first selected option is "Make this my new contact list" which is great, unless you just wanted to add a few new residents from a .CSV file. Overall: There are better services for messaging residents, and Notifii overplayed their hand. The track system is great for packages, but there are other options. Thank you so much for taking the time to give us your feedback on our package tracking software, Notifii Track! We appreciate that you gave the software an "A-" rating. There is a way to have the system wait to send out package notifications later so you can complete your intake before the notifications send. When you're in the Track module, go to "Settings". Scroll down a bit and you will see "Immediate versus Delayed Notifications". Check the box for delayed notifications and choose the amount of time you'd like the system to delay. We are sorry to hear your frustrations about Notifii Connect, our other product. We announced in the summer of 2018 that we would be changing our communication platform away from basic text and email to offer a full communication suite. We would love to chat with you more about your frustrations and help find a solution - please give our team a call at 888-506-8536. Pros: We have used Notifii for a year now and absolutely love it! Our residents love it as well. We no longer have phone calls asking if they have a package in the office, which saves us so much time. Cons: Nothing!! I'm just hoping that Notifii is capable soon of the texting option to residents and prospects regarding other things besides just the package notification. Thanks so much for this incredible feedback! We're so excited to hear that both your residents + employees are loving Notifii Track! Our client's satisfaction is our utmost priority and we're so happy to hear that Notifii Track is meeting your needs! So you know, we did just launch a new product that allows you to send texts and emails to all of your residents using templates, automated responses and groups! We'll reach out to you guys with more information in a few. Thanks again for your detailed review! Pros: I like most the ability to instantly let my residents know that their packages are here safe and ready for pick up at their leisure. Cons: The thing I like least about this software is that a blanket or mass email to residents indicates a package rather than just a communication. Overall: The business solution for us is streamlined communication for residents with an automatic follow up if they have not gotten their package. The really only downside is the mass email/text feature. Thank you so much for taking the time to review Notifii Track - we are so excited that you've titled your review "best app for multi family properties" and that you gave us a perfect 5-star review - thank you so much! Pros: Easy to use. Quick notification time to our residents. Efficient in that auto reminders are sent for packages. I love the function that allows our staff to take a photo of the package. This helps when searching through hundreds of packages! Our residents also enjoy knowing the sizes and quantity of their packages. Cons: Sometimes scanning barcodes is a bit tricky. Sometimes the scanner only records the postal zip code and will not accept the actual barcode or tracking number. Overall: Timeliness to report delivered packages to the residents. It's great that they get a text and will have access to the information most wherever they are. Pros: This system does it all. We can log packages in and out with ease. We love that we can take a photo of the package that gets sent to the resident so they know what we accepted for them. We can run reports to see when the highest volume of packages come in and go out and adjust our staff schedules to accommodate the increased traffic in our office. It really is a big timesaver. Cons: It's a little expensive since the system runs so smoothly and we never have to call for support. Overall: Before we started with this system our package area was overfilled with boxes that were not getting picked up. Our staff was consistently trying to call residents to get them to come and pick up their packages. Now since the system continues to text and email the resident every 3 days, this is no longer an issue. Pros: This software is very easy to use set up was simple. 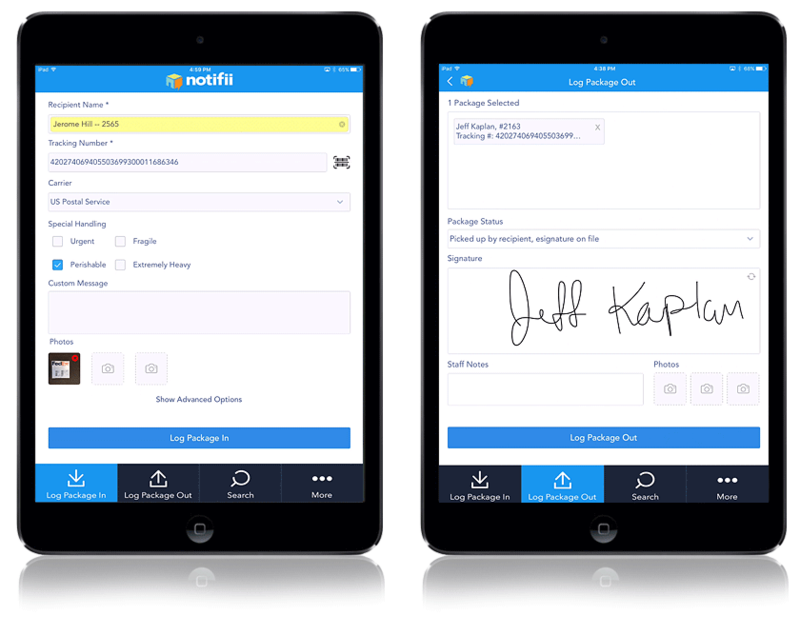 We have used Notifii for a few years and I would highly recommend it to other businesses. Cons: I do not have any complaints about the software at this time. Overall: The software updates nightly so there is no lack in updating email address. I like the ability to send reminder emails automatically however often we find it necessary. Thank you so much for your 5-star review on Notifii Track! We truly appreciate you taking the time to give us your feedback and we are so happy to hear that you feel like the software and set up was simple and easy - that's exactly what we're going for! As always, please let us know if you have any additional questions or feedback. Thanks again for taking the time to review us and we look forward to continuing to serve your community for years to come. Finally a product that makes your job easier! Pros: Notifii Track is so easy to use! Training new employees now takes minutes instead of days! The recipients love the email notifications. Being able to use mobile devices instead of proprietary scan guns has also been a game changer. Overall: Prior to using Notifii Track, we used a system that was antiquated. It required the use of scan guns which frequently broke down. The information on the guns had to be uploaded so package receipt information was not available until much later in the day. Delivery locations and recipient names were not easily editable. Notifii has definitely made things so much easier for the folks working in my shipping department and, even a year after switching, I am still getting rave reviews from the recipients. Pros: This software is easy to us it helps in the daily logging packages and signing in the out and tracking packages that have been miss log in wrong areas. Cons: There is nothing bad with this software I like using it is friend easy. Overall: I log in packages 24-7 lots of volume and tracking them is easy and secure. Thank you so much for taking the time to review Notifii Track! We are excited for your perfect 5-star rating and love hearing that you feel like the software is easy to use! Pros: Easy to scan in barcodes; easy search of the Resident's names; quick and easy to look up upon picking up. Cons: If we are looking up a specific package by date after it has been logged out, it is difficult to know when the package was logged in, and signed out. It would be easier to look it up by apartment number than by a date frame. Thank you so much for taking the time to review Notifii Track! We are happy to hear that you feel like Notifii Track is easy to use and that it's quick and easy to look up residents! Pros: Notifii is a great tool for tracking packages for residents. Because of the effectiveness, packages are picked up quicker. Also, the leasing office receives fewer calls from residents asking of they have packages. Cons: I wish there was a way to change the format of the actual text the resident receives so it does not look like spam. Thank you so much for taking the time to review Notifii Track! We are happy to hear that you feel like Notifii Track is a great tool for tracking packages and that you're experiencing shorter pick up times as well! There is a way to change the format of the texts, they are completely customizable. When you are logged into the desktop version, go to Track -> Settings -> Notification Templates and you can adjust to whatever best fits your needs! Hope that helps! Pros: Helps us to log in packages and keep track of them efficiently! Cons: That if you dont hit submit fast enough, the software will time out and the package does not get logged out. Overall: Really enjoy using it! Thank you so much for taking the time to review Notifii Track - we really appreciate the perfect 5-star review and love hearing that you feel like Notifii Track is a helpful addition to your package tracking operations! Pros: Over all easy to use. Provides the ability to search and filter options as well as create reports. We have a unique operation here and the software provides accountability and sends package reminders to keep the packages from sitting and being forgotten. Thank you so much for taking the time to review Notifii Track! We truly appreciate you taking the time to give us your feedback and look forward to serving you and your team for years to come! Pros: I love that it tracks the packages and helps manage them. Cons: The system runs slow sometimes and doesn't always get the correct tracking number from a scan. Overall: Overall Notifii has been an effective tool in managing packages. It helps save us time! Thank you so much for taking the time to review Notifii Track! We are happy to hear that you think Notifii Track is a great package management system and that you gave us a perfect 5-star review! Pros: The flow of the software is user friendly, quick and efficient. I have been able to instruct other users globally on how to properly use this platform with ease. Cons: Software does not track outgoing packages but does allow some existing features to make do. Overall: I originally learned about Notfii though my apartment complex. Going through the processes of receiving package notifications to checking out packages from the office. I saw this process appeared to be efficient with tracking internal packages so I was able to implement this system throughout the country at various facilities. Cons: I wish I could cc a second recipient when I know someone is on vacation/out on leave (this is the only reason I gave 4 stars for functionality). Overall: There are no longer missing packages. Even if we just sign something out as "put in mailbox" we have completed our duties. We are very satisfied with Notifii. Thank you so much for taking the time to review Notifii Track! We love hearing that you're no longer experiencing missing packages and that Notifii Track is saving your team time and stress. We very much appreciate your 5-star review of Notifii Track and look forward to continuing to serve you for years to come! Overall: We have been using this system for several years and it's awesome! Thank you so much for taking the time to review Notifii Track! We are happy to hear that you love the software and that you've had great experiences with our support team. Pros: The setup process was very easy and saves our team time each day. Cons: There aren't any cons at this time. We have been using the software for a couple years without any issues. Thank you so much for taking the time to review Notifii Track! We love hearing that your team saves time every day and that you've been utilizing the service for the past few years without any issues! The Pointe at Lenox Park LOVES Notifii! Pros: Ease of use, low-cost, resident approved! Cons: The only issue we have is in high volume times of package pick up, the logging out of packages can be a little time consuming, but not due to Notifii, simply due to the rush of office hours. Overall: Overall, our team and our residents love Notifii. It is a wonderful virtual amenity that our residents highly appreciate. Packages will always be a large part of our day in the leasing office, but Notifii Track is the perfect tool to streamline the logging process and opens a new line of communication with our residents. Thank you so much for taking the time to review Notifii Track! We absolutely love hearing that The Pointe at Lenox Park LOVES Notifii and that your residents appreciate the virtual amenity! Thank you so much for taking the time to review Notifii Track! We are happy to hear that you feel like the software works like a charm and that you gave us a perfect 5-star rating! Pros: The system is easy to use, little training is needed to understand it and we can manage it from multiple devices when needed. Cons: Sometimes the scanner picks up any barcode and not the actual shipping barcode. But we have learned to adjust our scanning. Overall: We are grateful for this software. We log hundreds of packages a week and this system is quick and easy. Pros: Easy to add residents and look them up. Easy and quick to send mass messages. Cons: Having to log in every few hours, just keep company computers logged in! Thank you so much for taking the time to review Notifii Track! We love hearing that you feel like the software is easy to use and that it's easy to add and look up specific residents.